AARP Public Policy Institute. "State Long-Term Care Reform in Louisiana." Washington, DC: AARP Public Policy Institute, 2008. Available at http://assets.aarp.org/rgcenter/il/2008_10_ltc_la.pdf. Alecxih, Lisa. "Nursing Home Use by the 'Oldest Old' Sharply Declines." Report to the National Press Club, November 21, 2006. Available at http://www.lewin.com/content/publications/NursingHomeUseTrendsPaperRev.pdf. Arias, Elizabeth. "United States Life Tables, 2008. "National Vital Statistics Reports, vol. 61, no. 3. Hyattsville, MD: National Center for Health Statistics, 2012. Available at http://www.cdc.gov/nchs/data/nvsr/nvsr61/nvsr61_03.pdf. Borck, Rosemary, Ashley Zlatinov, and Susan Williams. "Medicaid Analytic eXtract 2008 Encounter Data Chartbook." Report for the Centers for Medicare and Medicaid Services. Washington, DC: Mathematica Policy Research, 2013. Available at http://www.cms.gov/Research-Statistics-Data-and-Systems/Computer-Data-and-Systems/MedicaidDataSourcesGenInfo/MAX_Chartbooks.html. Braddock, David, Richard Hemp, Mary Rizzolo, Emily Shea Tanis, Laura Haffer, Amie Lulinski, and Jiang Wu. "State of the States in Developmental Disabilities 2013: The Great Recession and its Aftermath." Washington, DC: American Association on Intellectual and Developmental Disabilities, 2013. Brown, Randall, Carol Irvin, Debra Lipson, Sam Simon, and Audra Wenzlow. "Research Design Report for the Evaluation of the Money Follows the Person (MFP) Grant Program." Report for the Centers for Medicare and Medicaid Services. Cambridge, MA: MathematicaPolicy Research, October 3, 2008. Available at http://www.mathematica-mpr.com/publications/pdfs/MFP_designrpt.pdf. Bureau of Economic Analysis (BEA). "Per Capita Real GDP by State (Chained 2005 Dollars)." June 6, 2013. Available at http://www.bea.gov/iTable/index_regional.cfm. Bureau of Economic Analysis (BEA). "2009 Total Taxable Resources Estimates." September 21, 2009. Available at http://www.treasury.gov/resource-center/economic-policy/taxable-resources/Pages/Total-Taxable-Resources.aspx. Bureau of Labor Statistics (BLS). "Occupational Employment Statistics (OES). Home Health Aides (SOC Code 311011) and Personal and Home Care Aides (SOC Code 399021)." 2009. Available at http://www.bls.gov/oes/2008/may/oes_stru.htm#31-0000. Centers for Medicare and Medicaid Services (CMS). "Nursing Home Data Compendium 2012 Edition." Available at https://www.cms.gov/Medicare/Provider-Enrollment-and-Certification/CertificationandComplianc/downloads/nursinghomedatacompendium_508.pdf. Cheek, Mike, Martha Roherty, Grace Cho, Jenna Walls, Kathleen Gifford, Wendy Fox-Grage, and Kathleen Ujvari. "On the Verge: The Transformation of Long-Term Services and Supports." Washington, DC: AARP Public Policy Institute, February 2012. Denny-Brown, Noelle, and Debra J. Lipson. "Early Implementation Experiences of State MFP Programs." Reports from the Field: The National Evaluation of the Money Follows the Person Demonstration Grant Program, no. 3. Princeton, NJ: Mathematica Policy Research, November 2009. Available at http://www.mathematica-mpr.com/publications/PDFs/health/MFPfieldrpt3.pdf. Doty, Pamela. "Cost-Effectiveness of Home and Community-Based Long-Term Care Services." Washington, DC: U.S. Department of Health and Human Services, Office of the Assistant Secretary for Planning and Evaluation, Office of Disability, Aging and Long-Term Care Policy, June 2000. Available at http://aspe.hhs.gov/daltcp/reports/2000/costeff.htm. Doty, Pamela. "The Evolving Balance of Formal and Information, Institutional and Non-Institutional Long-Term Care for Older Americans: A Thirty-Year Perspective." In Advancing Home and Community-Based Services: Transforming Policies, Programs, and Service Delivery in Long-Term Care, Public Policy and Aging Report, vol. 20, no. 1, Winter/Spring 2010. Available at http://www.hcbs.org/files/193/9616/PP&AR.pdf. Eiken, Steve. "Promising Practices in Long-Term Care Systems Reform: Common Factors of Systems Change." Report for the Centers for Medicare and Medicaid Services. Washington, DC: Medstat, November 9, 2004. Available at https://www.cms.gov/PromisingPractices/Downloads/commonfactors.pdf. Eiken, Steve, Kate Sredl, Brian Burwell, and Lisa Gold. "Medicaid Expenditures for Long-Term Services and Supports: 2011 Update." Cambridge, MA: Thomson Reuters, October 31, 2011. Available at http://www.hcbs.org/files/208/10395/2011LTSSExpenditures-final.pdf. Farmer, Bonnie Cashin. "A Nursing Home and Its Organizational Climate: An Ethnography." Westport, CT: Greenwood Publishing Group, 1996. Federal Housing Finance Agency. "Housing Price Index, 4th quarter 2010." September 30, 2011. Available at http://www.fhfa.gov. Feinberg, Lynn Friss, and Sandra L. Newman. "A Study of 10 States Since Passage of the National Family Caregiver Support Program: Policies, Perceptions, and Program Development." Gerontologist, vol. 44, no. 6, 2004. Available at http://gerontologist.oxfordjournals.org/content/44/6/760.full.pdf+html. Franks, Jeannette S. "Comparing Perceived Quality of Life in Nursing Homes and Assisted Living Facilities." Journal of GerontologicalSocial Work, vol. 43, no. 1, 2004. Grabowski, David. "The Cost-Effectiveness of Noninstitutional Long-Term Care Services: Review and Synthesis of the Most Recent Evidence." Medical Care Research and Review, vol. 63, no. 3, February 2006, pp. 3-28. Green, Angela, Joshua Wiener, Galina Khatutsky, et al. "Medicaid in Residential Care." Washington, DC: U.S. Department of Health and Human Services, Office of the Assistant Secretary for Planning and Evaluation, Office of Disability, Aging and Long-Term Care Policy, 2013. Available at http://aspe.hhs.gov/daltcp/reports/2013/FacBenDif.shtml. Harrington, Charlene, Terence Ng, and Martin Kitchener. "Do Medicaid Home and Community Based Service Waivers Save Money?" Home Health Care Services Quarterly, vol. 30, no. 4, 2011, pp. 198–213. Available at http://www.tandfonline.com/doi/abs/10.1080/01621424.2011.622249. Health Care Financing Administration. "Long Term Care: Background and Future Directions." HCFA 81-20047. January 1981. Howes, Candace. "The Best and Worst State Practices in Medicaid Long-Term Care." Direct Care Alliance Policy Brief, no. 3, April 2010. Available at http://www.hcbs.org/files/180/8982/HowesMedicaidPolicyBrief.pdf. Irvin, Carol V., and Jeffrey Ballou. "The Starting Point: The Balance of State Long-Term Care Systems Before the Implementation of the Money Follows the Person Demonstration." Reports from the Field: The National Evaluation of the Money Follows the Person Demonstration Grant Program, no. 4. Princeton, NJ: MathematicaPolicy Research, May 2010. Available at http://www.mathematica-mpr.com/publications/pdfs/health/mfpfieldrpt4.pdf. Kaiser Family Foundation (KFF). "Medicaid Home and Community-Based Service Programs: 2009 Data Update." Washington, DC: Kaiser Commission on Medicaid and the Uninsured, December 2012. Available at http://kaiserfamilyfoundation.files.wordpress.com/2013/01/7720-06.pdf. Kaiser Family Foundation (KFF). "State Options That Expand Access to Medicaid Home and Community-Based Services. "Washington, DC: Kaiser Commission on Medicaid and the Uninsured, October 2011. Available at http://kaiserfamilyfoundation.files.wordpress.com/2013/01/8241.pdf. Kane, Rosalie, Robert Kane, Reinhard Priester, and Patricia Homyak. "Research on State Management Practices for the Rebalancing of State Long-Term Care Systems: Final Report." Submitted to the Centers for Medicare and Medicaid Services, Division of Advocacy and Special Initiatives.June 2008. Kassner, Enid, Susan Reinhard, Wendy Fox-Grage, Ari Houser, and Jean Accius, with Barbara Coleman and Dann Milne. "A Balancing Act: State Long-Term Care Reform." Washington, DC: AARP Public Policy Institute, July 2008. Available at http://assets.aarp.org/rgcenter/il/2008_10_ltc.pdf. Kaye, H. Stephen. "Gradual Rebalancing of Medicaid Long-Term Services and Supports Saves Money and Serves More People, Statistical Model Shows." Health Affairs, vol. 31, no. 6, 2012. Kaye, H. Stephen, Mitchell LaPlante, and Charlene Harrington. "Do NoninstitutionalLong-Term Care Services Reduce Medicaid Spending?" Health Affairs, vol. 28, no. 1, 2009, pp. 262-272. Available at http://content.healthaffairs.org/content/28/1/262.full.pdf+html. Keenan, Teresa. "Home and Community Preferences of the 45+ Population." Washington, DC: AARP Research and Strategic Analysis, November 2010. Available at http://assets.aarp.org/rgcenter/general/home-community-services-10.pdf. Kemper, Peter, Robert Applebaum, and Margaret Harrigan. "Community Care Demonstrations: What Have We Learned?" Health Care Financing Review, vol. 8, no. 4, Summer 1987, pp. 87-100. Kemper, Peter. "Evaluation of the National Long Term Care Demonstration: Overview of Findings." Health Services Research, vol. 23, no. 1, April 1988, pp. 161-174. Kitchener, Martin, Terence Ng, Nancy Miller, and Charlene Harrington. "Institutional and Community-Based Long-Term Care: A Comparative Estimate of Public Costs." Journal of Health and Social Policy, vol. 22, no. 2, August 2006, pp. 31-50. Lakin, Charlie. "Behavioral Outcomes of Deinstitutionalization for People with Intellectual and/or Developmental Disabilities: Third Decennial Review of U.S. Studies, 1977-2010." Policy Research Brief. Minneapolis, MN: University of Minnesota Research and Training Center on Community Living, April 2011. Available at http://ici.umn.edu/products/prb/212/212.pdf. Lakin, K. Charlie, Sheryl Larson, Pat Salmi, and Naomi Scott. "Residential Services for Persons with Developmental Disabilities: Status and Trends Through 2008." Minneapolis, MN: University of Minnesota, Research and Training Center on Community Living, Institute on Community Integration, 2009. Available at http://rtc.umn.edu/risp/docs/risp2008.pdf. LaPlante, Mitchell. "The Woodwork Effect in Medicaid Long-Term Services and Supports." Journal of Aging and Social Policy, vol. 25, no. 2, 2013, pp. 161-180. Lester, Rebecca Sweetland, Carol V. Irvin, and Wilfredo Lim. "Recent Developments in State Efforts to Rebalance Long-Term Services and Supports." Reports from the Field: The National Evaluation of the MFP Demonstration, no. 13. Cambridge, MA: MathematicaPolicy Research, October 2013. Available at http://www.mathematica-mpr.com/publications/redirect_PubsDB.asp?strSite=PDFs/health/MFPfieldrpt13.pdf. Lightfoot, Elizabeth. "Older Adults with Developmental Disabilities." In Handbook of Social Work in Health and Aging, edited by Barbara Berkmanand Sarah D'Aambruoso. New York, NY: Oxford University Press, 2006. Louisiana Department of Health and Hospitals. "Louisiana's Plan for Choice in Long-Term Care: Comprehensive Long-Term Care Reform Plan." October 2007. Available at http://www.dhh.louisiana.gov/assets/docs/OAAS/LTCSysChange/ChoiceinLTCPlan.pdf. MetLife. "Market Survey of Long-Term Care Costs: The 2009 MetLife Market Survey of Nursing Home, Assisted Living, Adult Day Services, and Home Care Costs." October 2009. Available at https://www.metlife.com/assets/cao/mmi/publications/studies/mmi-market-survey-nursing-home-assisted-living.pdf. Miller, Nancy A. "Relations AmongHome- and Community-Based Services Investment and Nursing Home Rates of Use for Working-Age and Older Adults: A State-Level Analysis." American Journal of Public Health, vol. 101, no. 9, September 2011. Mills, K., A.C. Graham, B.T. Winslow, and K.L. Springer. "Treatment of Nursing Home-Acquired Pneumonia." American Family Physician, vol. 79, no. 11, June 1, 2009, pp. 976-982. Mollica, Robert. "State Medicaid Reimbursement Policies and Practices in Assisted Living." Washington, DC: National Center for Assisted Living, September 2009. Available at http://www.ahcancal.org/ncal/resources/documents/medicaidassistedlivingreport.pdf. Mollica, Robert, and Jennifer Gillespie. "Single Entry Point Systems: State Survey Results." New Brunswick, NJ: Rutgers/NASHP Community Living Exchange Collaborative, August 2003. Available at http://www.onceinaweil.org/system/files/CLE_single_entry_point.pdf. Mollica, Robert L., and Susan C. Reinhard. "Rebalancing State Long-Term Care Systems." Ethics, Law, and Aging Review, vol. 11, 2005, pp. 23-41. Moore, Judith, and David Smith. "Legislating Medicaid: Considering Medicaid and Its Origins." Health Care Financing Review, vol. 27, no. 2, Winter 2005-2006.Available at https://www.cms.gov/Research-Statistics-Data-and-Systems/Research/HealthCareFinancingReview/downloads/05-06Winpg45.pdf. Muramatsu, Naoko, HongjunYin, and Donald Hedeker. "Functional Declines, Social Support, and Mental Health in the Elderly: Does Living in a State Supportive of Home and Community-Based Services Make a Difference?" Social Science and Medicine, vol. 70, no. 7, April 2010. National Association of State Budget Officers. "Fiscal Year 2009 State Expenditure Report." Fall 2010.Available at http://www.nasbo.org/node/59. National Oceanic and Atmospheric Administration (NOAA). "Area-Weighted Seasonal Normals, 1971-2000 (and Previous Periods)." In State, Regional, and National Seasonal Temperature and Precipitation, Historical Climatography Series No. 4-3, August 2002. Available at http://cdo.ncdc.noaa.gov/climatenormals/hcs/HCS_43.pdf. New Jersey Department of Health and Senior Services. "Independence, Dignity and Choice in Long-Term Care Act: Annual Report." July 1, 2009. Available at http://www.state.nj.us/humanservices/doas/documents/idc_report_709.pdf. Ng, Terence. "HCBS Waiver Wait Lists: National Estimates 2012." Presented at the National Home and Community Based Services Conference, Arlington, VA, September 2013. Available at http://www.nasuad.org/documentation/HCBS_2013/Presentations/9.11%2010.00-11.15%20Roosevelt.pdf. Park-Lee, Eunice, Christine Caffrey, Manisha Sengupta, et al. "Residential Care Facilities: A Key Sector in the Spectrum of Long-Term Care Providers in the United States." Washington, DC: U.S. Department of Health and Human Services, Office of the Assistant Secretary for Planning and Evaluation, Office of Disability, Aging and Long-Term Care Policy, December 2011. Available at http://aspe.hhs.gov/daltcp/reports/2011/RCFkey.shtml. Peterson, Greg, Randall Brown, and Allison Barrett. "The Impacts of Waiting Periods for Home-and Community-Based Services on Consumers and Medicaid Costs in Iowa." Presented at the National Home and Community Based Services Conference, Arlington VA, September 2013. Available at http://www.nasuad.org/documentation/HCBS_2013/Presentations/9.11%2010.00-11.15%20Roosevelt.pdf. Prohaska, Thomas R., Lynda A. Anderson, and Robert H. Binstock. "Public Health for an Aging Society." Baltimore, MD: Johns Hopkins University Press, 2012. Pruchno, Rachel A., and Miriam S. Rose. "Effect of Long-Term Care Environments on Health Outcomes." Gerontologist, vol. 40, no. 4, 2000. Reinhard, Susan. "Money Follows the Person: Un-burning Bridges and Facilitating a Return to the Community." Generations, 2012. Available at http://asaging.org/blog/money-follows-person-un-burning-bridges-and-facilitating-return-community. Reinhard, Susan, Enid Kassner, Ari Houser, and Robert Mollica. "Raising Expectations: A State Scorecard on Long-Term Services and Supports for Older Adults, People with Physical Disabilities, and Family Caregivers." Washington, DC: AARP, September 2011. Available at http://www.longtermscorecard.org/Report.aspx?page=all. Rose, Miriam, Farida K. Ejaz, Linda S. Noelker, and Melissa Castora-Binkley. "Recent Findings on Home and Community-Based ServicesAcross States." In "Advancing Home and Community-Based Services: Transforming Policies, Programs, and Service Delivery in Long-Term Care." Public Policy and Aging Report, vol. 20, no. 1, Winter/Spring 2010. Available at http://www.hcbs.org/files/193/9616/PP&AR.pdf. Rozario, Philip A., and Elizabeth Palley. "When the Private Sphere Goes Public: Exploring the Issues Facing Family Caregiver Organizations in the Development of Long-Term Care Policies. "Social Work in Public Health, vol. 23, no. 4, October 2008. Ruttner, Laura, and Carol V. Irvin. "Implications of State Methods for Offering Personal Assistance Services." Medicaid Policy Brief no. 18. Chicago, IL: MathematicaPolicy Research, June 2013. Available at http://www.mathematica-mpr.com/publications/pdfs/health/max_ib18.pdf. Shirk, Cynthia. "Rebalancing Long-Term Care: The Role of the Medicaid HCBS Waiver Program." National Health Policy Forum Background Paper, March 3, 2006. Available at http://www.nhpf.org/library/background-papers/BP_HCBS.Waivers_03-03-06.pdf. Siebenaler, Kristin, Janet O'Keeffe, David Brown, and Christine O'Keeffe. "Nursing Facility Transition Initiatives of the Fiscal Year 2001 and 2002 Grantees: Progress and Challenges, Final Report." Research Triangle Park, NC: RTI International, 2005. Available at http://www.hcbs.org/files/74/3656/NFT_final_web.pdf. Smith, Gary, Janet O'Keeffe, Letty Carpenter, Pamela Doty, Gavin Kennedy, Brian Burwell, Robert Mollica, and Loretta Williams. "Understanding Medicaid Home and Community Services: A Primer." Washington, DC: U.S. Department of Health and Human Services, Office of the Assistant Secretary for Planning and Evaluation, Office of Disability, Aging and Long-Term Care Policy, October 2000. Available at http://aspe.hhs.gov/daltcp/reports/primer.htm. Smith, Gary, John Agosta, Jon Fortune, and Janet O'Keeffe. "Gauging the Use of HCBS Supports Waivers for People with Intellectual and Developmental Disabilities: Final Project Report." Washington, DC: U.S. Department of Health and Human Services, Office of the Assistant Secretary for Planning and Evaluation, Office of Disability, Aging and Long-Term Care Policy, April 2007. Available at http://aspe.hhs.gov/daltcp/reports/2007/gaugingfr.htm#hcbs. Smith, Vernon K., Kathleen Gifford, Eileen Ellis, Robin Rudowitz, Molly O'Malley Watts, and Caryn Marks. "The Crunch Continues: Medicaid Spending, Coverage and Policy in the Midst of a Recession. Results from a 50-State Medicaid Budget Survey for State Fiscal years 2009 and 2010." Washington, DC: Kaiser Commission on Medicaid and the Uninsured, September 2009. Available at http://www.kff.org/medicaid/upload/7985.pdf. Social Security Administration. "State Assistance Programs for SSI Recipients, January 2009." Office of Research, Evaluation, and Statistics, October, 2009. Available at http://www.ssa.gov/policy/docs/progdesc/ssi_st_asst/2009/ssi_st_asst09.pdf. Spillman, Brenda, Korbin Liu, and Carey McGilliard. "Trends in Residential Long-Term Care: Use of Nursing Homes and Assisted Living and Characteristics of Facilities and Residents." Washington, DC: U.S. Department of Health and Human Services, Office of the Assistant Secretary for Planning and Evaluation, Office of Disability, Aging and Long-Term Care Policy, November 25, 2002. Available at http://aspe.hhs.gov/daltcp/reports/2002/rltct.htm. University of Colorado. "The State of the States in Developmental Disabilities Project." Boulder, CO: American Association on Intellectual and Developmental Disabilities, 2013. Available at http://www.stateofthestates.org/index.php/intellectualdevelopmental-disabilities/state-profiles. U.S. Court of Appeals. "Pennsylvania Protection and Advocacy, Inc. v. Pennsylvania Department of Public Welfare." Third Circuit. 402 F.3d 374 (2005).Available at http://www.clearinghouse.net/chDocs/not_public/PB-PA-0005-0003.pdf. U.S. Department of Health and Human Services (HHS), Office of the Assistant Secretary for Planning and Evaluation (ASPE), Office of Social Services Policy. "Working Paper on Long-Term Care." Under Secretary's Task Force on Long-Term Care, October 1981.Available at http://aspe.hhs.gov/daltcp/reports/wrkppres.htm. U.S. Department of Health and Human Services (HHS). "Medicaid Program: Final Rule." Federal Register, vol. 79, no. 11, January 16, 2014, pp. 2948-3039. U.S. Government Accountability Office. "Medicaid: States' Plans to Pursue New and Revised Options for Home- and Community-Based Services." GAO-12-649. June 2012. Available at http://www.gao.gov/assets/600/591560.pdf. U.S. Supreme Court. "Olmstead v. L. C. (98-536) 527 U.S. 581." 1999. Available at http://www.law.cornell.edu/supct/pdf/98-536P.ZO. Vladeck, Bruce C. "Unloving Care: The Nursing Home Tragedy." New York, NY: Basic Books, 1980. Walker, Lina. "Fact Sheet: Health Care Reform Improves Access to Medicaid Home and Community-Based Services." Fact Sheet 192. Washington, DC: AARP Public Policy Institute, June 2010. Available at http://assets.aarp.org/rgcenter/ppi/ltc/fs192-hcbs.pdf. Walls, Jenna, Kathleen Gifford, Catherine Rudd, Rex O'Rourke, Martha Roherty, Lindsey Copeland, and Wendy Fox-Grage. "Weathering the Storm: The Impact of the Great Recession on Long-Term Services and Supports." Washington, DC: AARP Public Policy Institute, January 2011. Available at http://www.hcbs.org/files/201/10001/ResearchReport.pdf. Wenzlow, Audra T., Robert Schmitz, and Kathy Shepperson. "A Profile of Medicaid Institutional and Community-Based Long-Term Care Service Use and Expenditures Among the Aged and Disabled Using MAX 2002: Final Report." Washington, DC: U.S. Department of Health and Human Services, Office of the Assistant Secretary for Planning and Evaluation, Office of Disability, Aging and Long-Term Care Policy, January 18, 2008.Available at http://aspe.hhs.gov/daltcp/reports/2008/profileMAX.htm. Wenzlow, Audra, Rosemary Borck, and Dean Miller. 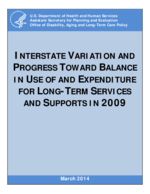 "An Investigation of Interstate Variation in Medicaid Long-Term Care Use and Expenditures." Report for the U.S. Department of Health and Human Services, Office of the Assistant Secretary for Planning and Evaluation. Cambridge, MA: MathematicaPolicy Research, April 2011. Wiener, Joshua M., Wayne L. Anderson, and David Brown. "Why Are Nursing Home Utilization Rates Declining?" Research Triangle Park, NC: RTI International, 2009. Available at https://www.hcbs.org/files/160/7990/SCGNursing.pdf. Wodchis, Walter P., John P. Hirdes, and David H. Feeny. "Health-Related Quality of Life Measure Based on the Minimum Data Set." International Journal of Technology Assessment in Health Care, vol. 19, no. 3, 2003.